Here is my second post for today. 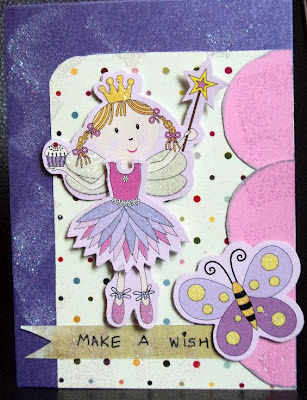 I am following the sketch challenge from The Craft's Meow May Challenge. Love their sketches (though this is my first ever entry) and this month's challenge is sketched by Nina. Well, my cousin will be celebrating her 12th birthday next month. This sketch inspired me to make her a beautiful birthday card (which I'll have to post soon enough to reach her before her birthday with her gift). So yeah, thanks to The Craft's Meow for this challenge. And here's my take on the sketch (please excuse my picture taking skills!!). This is so Beautiful Aarti. Love that cute Fairy there. Thanks for participating in the challenge at my Blog. What an adorable card! Great colors, and so happy to hear that you joined for the first time! Thanks for playing at The Craft's Meow this month. Such a cutie pie card! Thanks for joining us at The Craft's Meow! This card is so cute ! ♥ I love the type of Rubban, it' makes vintage !